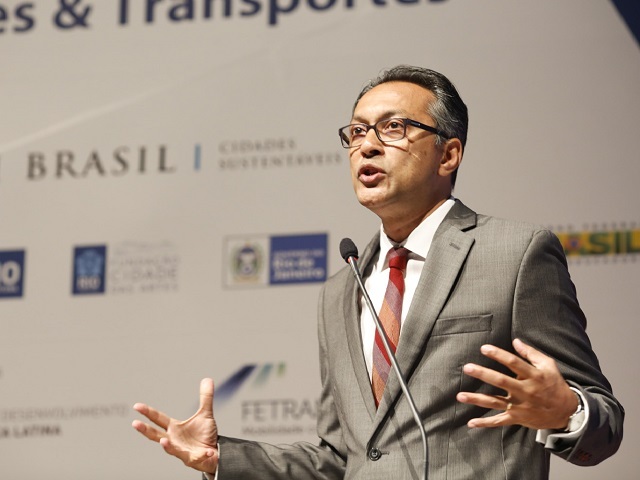 Today marked the second and final day of the Cities & Transport International Congress in Rio de Janeiro, Brazil, where more than 1,000 participants and 130 speakers gathered to share their experiences and ideas on how to forge sustainable cities. 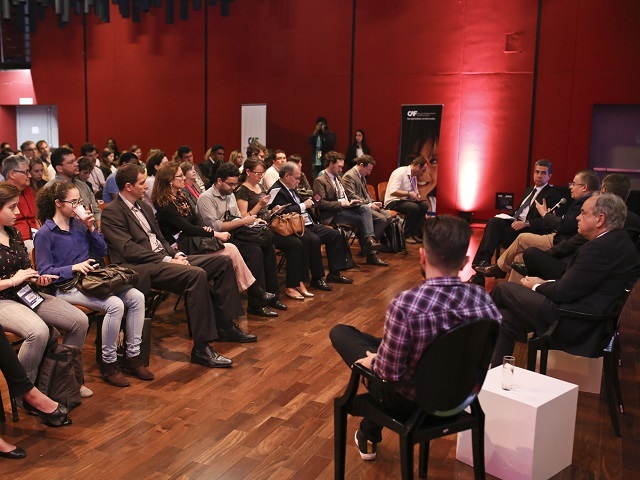 The main stage featured talks on the New Climate Economy, the challenges and demands facing public transport, and how the media plays a role in creating sustainable cities. “Marta [Ramirez] lives in Mexico City, she travels every morning for 2.5 hours to work… 40 percent of her salary goes toward transit. Five years of her life will be lost in transit… and there are hundreds and millions of people like Marta in the world, and I can guarantee that all of you know at least one Marta,” opened Ani Dasgupta, Global Director of WRI Ross Center for Sustainable Cities. As Marta’s story makes clear, poor public transport coupled with widespread congestion is not only an inconvenience, but also has an impact on people’s economic well-being in deep and profound ways. Considering how widespread an issue this is, it becomes clear that our continued reliance on personal vehicles is costing cities billions in productivity–and even more in health risks. However, governments are often reluctant to make the move to more sustainable practices because they fear that these investments will stifle economic growth. Indeed, many people mistakenly believe that climate action and economic development are opposing forces. Instead of seeing the two as mutually exclusive goals, Dasgupta urged cities to use the framework of the New Climate Economy (NCE), developed by the Global Commission on the Economy and Climate, to achieve both simultaneously. This vision, backed by strong research, outlines how cities can boost their economies by moving toward a low-carbon future. “A one billion [dollar] public investment can unleash fifteen to twenty billion in private investment,” Dasgupta said. Taking this low-carbon approach is perhaps most important for developing cities, which are often still constructing basic infrastructure. These cities in particular should avoid locking into a high-carbon growth path centered on personal car use and sprawl; instead, they should look to invest in building efficiency, public transport, and better waste management, which could generate a net savings of $17 trillion by 2050. Best practices for accomplishing this include pedestrianizing streets, implementing bus rapid transit (BRT) systems–similar to those in Johannesburg and Rio de Janeiro–and creating public bike share programs. With cities producing 70 percent of the world’s greenhouse gases and accounting for 85 percent of the global GDP, urban areas can no longer afford to rely on dirty, unsafe transport and infrastructure. Rather, investing in long-term, healthier practices will not only help combat climate change, but also boost productivity, create jobs, reduce health costs, and combat poverty. City leaders unanimously agreed that improving public transport is an effective means of combating congestion, decreasing emissions and improving health–but some speakers warned that building a dense urban core has caused overcrowding in transport systems and inequitable access to basic public services on the periphery. To help alleviate these problems, Brazil passed the Statute of Metropolis in 2015, which forced metropolitan municipalities to collaborate with city governments on issues of mobility. The law created opportunities to solve some of the problems that have accompanied suburban sprawl, such as the “imbalance of services such as health, employment, [and] education” said Riley Rodrigues, Senior Specialist of Industrial Competitiveness and System Investments at the union of industries for Rio de Janeiro, FIRJAN. The statute may serve as a good model for other countries to follow when thinking about suburban sprawl, but representatives urged that the statute isn’t enough. After transport services are expanded between metropolitan areas and city centers, citizens need to have access to information in order to improve commute times and avoid congestion. “90 percent of public transport users have communication devices, such as cell phones. If [a user] has access to information, [he/she] will choose the best routes and avoid [congested areas]” said Severiano Macedo, Business Development Manager at Cisco. In a session on technology and urban planning, experts noted that “data is the new oil,” and urged city leaders to take advantage of innovative software to improve urban mobility. Finally, when considering changes to public transport and road regulations, experts emphasized that road safety should come first. According to the World Health Organization, 3,400 people die on the world’s roads every day; moreover, “3 million [people die] from pollution each year,” said Claudia Adriazola, Health and Road Safety Director at WRI Ross Center for Sustainable Cities. As more of the world’s population accumulates in urban areas, cities have the obligation to ensure that streets are safe for all citizens–especially pedestrians and cyclists, the two most vulnerable groups–and that they should monitor the impact of pollution from vehicles on local health. At the time of a global epidemic of traffic crashes and fatalities, “you should not fund a transportation project that isn’t safe” summed up Hilda María Gomez, Road Safety Senior Specialist at CAF.